Two art shows open March 16 in the Illinois Central College art galleries, located on the East Peoria Campus. Pictures Cross Generations, a curated retrospective exhibition of the photographic works of Ray Soughan, will be on display in the ICC Performing Arts Center Gallery, located in the lobby of the ICC Performing Arts Center. 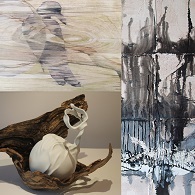 Three Graces Under Pressure, an installation featuring painting, drawing and sculpture by artists Sherri Denault, Margie Glass Sula, and Patty McWilliams will be on display in Gallery 336B, located in the Academic Building. Both shows run through April 8. An opening reception for the exhibition of Soughan’s work takes place March 17, in the Performing Arts Center Gallery from noon to 2 pm, with a curatorial talk scheduled for 1 pm. The Pictures Cross Generations exhibit is curated by Stephanie Van Doren, Soughan’s granddaughter and gallery specialist at ICC. Upon his passing in 1999, she inherited his darkroom and all his negatives. As she began to sort through the negatives, she realized there was a treasure trove of images documenting the human experience before, during, and after World War II. Soughan was instrumental in the restoration of the historic Emboyd (now called Embassy) Theatre in his community of Fort Wayne, Ind. Several photographs in the exhibit are from his negatives documenting and archiving old images for the theater, while others are photographs of people, places, and experiences Van Doren specifically chose for their historical and visual interest. The negatives used for Pictures Cross Generations span roughly 1930 to 1970, even though some of the historical documentation pre-dates this time period. The Three Graces Under Pressure exhibit derives its name from what the artists consider three classical studies–or the “three graces of artistic self-expression”–in the fine arts: painting, drawing and sculpture. As technology infiltrates almost all aspects of human life, including the fine arts, this places the three graces under extreme pressure to remain relevant in a digitized world. Works in this exhibition are completely void of technological influence and are produced purely by human creativity, humans’ innate drive to make tangible things that for some reason still remains relevant as pure art objects despite the digital invasion. The works are aesthetically linked through line, texture, shape, muted tones, and thought process. The three graces provide the human element of creativity an avenue for surviving today, fulfilling the need to unplug and enjoy the particular things that give humans the pause needed in the virtual chaotic life events of this time. Hours of operation for Gallery 336B are Monday through Thursday, from 9 am to 5 pm, and Friday from 9 am to noon. The Performing Arts Center Gallery is open Monday through Thursday, from 9:30 am to 7:30 pm, and Friday from 9:30 am to noon. Operation of the galleries does vary with ICC’s holidays and breaks; to confirm a gallery will be open at a particular time, call the ICC Arts and Communication Department at (309) 694-5113. The Performing Arts Center Gallery also is accessible when the Performing Arts Center is open for public events.